Updated from its predecessor, the popular 10-year-old Tamron 18-200mm f/3.5-6.3 XR Di II LD, the latest incarnation benefits from Tamron’s Vibration Compensation (VC) system to help counteract the effects of camera shake. The new version is lighter, too, weighing in at 400g to make it the lightest super-zoom in its class, and costing just $249, it’s the cheapest, too. We’ve been busy testing the Nikon DX version across a range of Nikon DSLRs in our lab and are delighted to reveal the verified results. Tested on the Nikon D5300 the Tamron 18-200mm f/3.5-6.3 achieves an overall DxOMark Score of 13 points, which although 2 points more than the Canon version, still ranks towards the lower end of the performance spectrum. Its strongest performance is at the widest 18mm focal length using the largest f/3.5 aperture, where it offers the best results for transmission, sharpness, and chromatic aberration. The variable maximum aperture of f/3.5 at 18mm to f/6.3 at 200mm reduces light transmission the more you zoom in, and we measured a maximum TStop aperture of just over 6.7 at 200mm. As a result, expect a pretty dark viewfinder when zoomed in to 200mm, which will also have an impact on the lens’s autofocus performance, particularly in low-light conditions. For sharpness, the overall P-Mpix map indicates stronger resolution at wider focal lengths between 18mm to 50mm and the wider aperture settings up to f/11. Again, this is a slight improvement on the Canon version we tested, with stronger center sharpness recorded by the Nikon lens (indicated in green on the sharpness P-Mpix map). If you’re planning to shoot a lot at the long 200mm end of the focal range, then mid-aperture settings of f/11 offer the best sharpness, with resolution around 65% in the center of the frame, dropping off to 55% in the outer field. Using the maximum f/6.3 aperture at 200mm, results are softer both in the center and on the edges of the frame compared to resolution at f/11. Super-zoom lenses tend to suffer from both barrelling at the wider focal lengths and pincushion distortion when zoomed in. This is true of the Tamron 18-200mm f/3.5-6.3, with 0.9% barrel distortion at 18mm and pincushion distortion of –0.4% at 200mm, giving it an overall sistortion score of 0.5%. Those results are consistent with a super-zoom of this type, however, and the Tamron 18-200mm f/3.5-6.3 offers distortion-free results when shooting at a 28mm focal length. Global maps for both chromatic aberration and vignetting show results that are not a major concern for either on the Tamron 18-200mm f/3.5-6.3 at most settings. For chromatic aberration, problematic results of over 18 micrometers only start to occur using the longer focal lengths with smaller apertures between f/16 to f/36. With wider apertures up to f/11, however, fringing is well-controlled at all focal lengths. 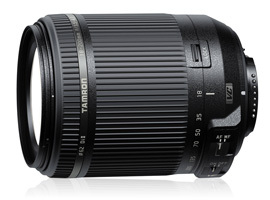 In terms of vignetting, the Tamron 18-200mm f/3.5-6.3 facilitates good intensity of light under –1Ev to reach the corners of the frame at almost all settings, with the exception of the widest focal lengths between 18mm to 28mm using the largest f/3.5 aperture. The $399 Sigma 18-200mm f/3.5-6.3 DC Macro OS HSM and Nikon’s own DX VR 18-200mm f/3.5-5.6G IF-ED are both similar propositions to the Tamron 18-200mm f/3.5-6.3. All three include image stabilization, built-in autofocus motors, and a variable aperture system, although the own-brand Nikon 18-200mm offers an extra 1/3 stop of light transmission with a maximum aperture of f/5.6 at 200mm, compared to f/6.3 for the third-party competition. The Nikon 18-200mm we’ve tested has now been replaced with a Mark II version, the $647 AF-S DX Nikkor 18-200mm f/3.5-5.6G ED VR II, that we are still waiting to test. 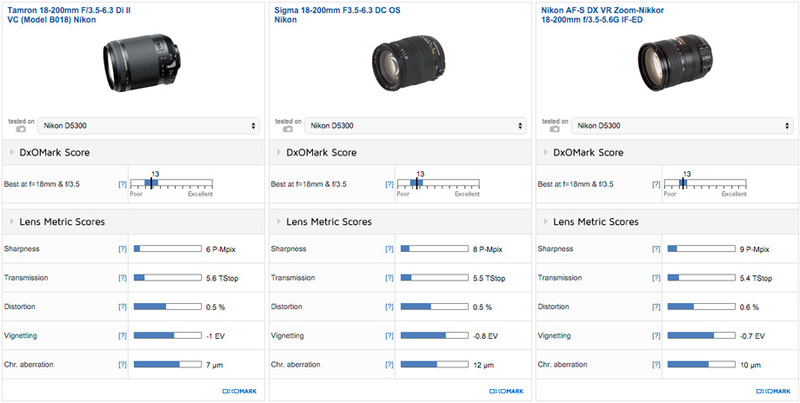 All three tested super-zooms achieve the same overall DxOMark score of 13 points tested on the D5300, with fairly similar lens metric scores. The new Tamron 18-200mm f/3.5-6.3 is a little off the pace for sharpness, however, with a score of 6 P-Mpix compared to 8 P-Mpix for the Sigma and 9 P-Mpix for the Nikon version (again tested on the D5300). Take a look at the comparison P-MPix map and you can see more green and yellow areas for the Sigma and Nikon versions, which indicate stronger center resolutions at these settings. While all three lenses offer good resolution at 18mm using wider apertures up to f/8, the Sigma and Nikon versions extend this good sharpness up to around 50mm at f/8, providing sharper results for general-use shooting. At the maximum 200mm focal length, all three lenses suffer some sharpness drop-off in the outer field, but again, the Sigma and Nikon versions are stronger in the center of the frame. The own-brand Nikon super-zoom is 1/3 of a stop stronger than the Tamron for vignetting using the maximum aperture, with a score of –0.7EV compared to –1EV, but it’s a small difference. The new Tamron super-zoom fares slightly better for chromatic aberration, however, with a lower score of 7um compared to 10um, but again, it’s well-controlled on both lenses. As an interesting second comparison, Nikon has a slightly shorter focal length $497 AF-S DX 18-140mm f/3.5-5.6G ED VR available. As we’ve seen, a downside with an all-in-one super zoom is that it struggles to be optically strong at both ends of the focal range, and these super-zooms perform better at the wider focal lengths. So while the Nikon 18-140mm isn’t quite as versatile, it still offers a good all-round solution, including wide-angle and telephoto focal lengths. Its maximum 140mm focal length (equivalent to 210mm in 35mm terms) is still a very usable focal length for sports and wildlife, and between 70-140mm, it is ideal for portraiture on a DX-format camera. While most lens metrics between the Tamron 18-200mm and Nikon 18-140mm are similar, there’s a big sharpness advantage with the Nikon, which achieves a score of 11 P-Mpix – almost twice the resolution of the Tamron. The Nikon is as sharp as the Tamron at wider focal lengths, so still good for landscape and restricted composition shots, but it’s much sharper at 140mm compared to the Tamron and Nikon 18-200mm versions. For example, at 140mm f/5.6, the Nikon 18-140mm offers good center sharpness with only limited edge drop-off compared to its rivals. Lightweight, convenient, and affordable, the Tamron 18-200mm f/3.5-6.3 will be a popular mass-market lens for enthusiasts shooting APS-C. Covering a versatile wide-angle to long telephoto focal range in a relatively compact and lightweight unit makes it challenging for super-zooms to deliver top image quality however. As we’ve seen, the Tamron 18-200mm f/3.5-6.3’s overall DxOMark score of 13 point ranks towards the lower end of the performance spectrum when tested on the Nikon D5300. Within its own APS-C super-zoom 18-200mm class, it achieves the same overall DxOMark score of 13 points as its Sigma and Nikon rivals. Both the Sigma and Nikon versions offer slightly improved sharpness, however, and offer better resolution than the Tamron at a 50mm focal length. At 200mm, sharpness for all three lenses isn’t great, however, so if it’s good performance at long focal lengths you desire, you should consider a lens with a shorter focal range such as the Nikon 18-140mm. With the addition of Tamron’s Vibration Compensation system on the new 18-200mm f/3.5-6.3 super zoom, however, together with the weight reduction down to just 400g — around 1/3 lighter than the Nikon alternative — it’s a good value-for-money option for those photographers looking to lessen the load.